NASA Earth Observatory images by Jesse Allen and Lauren Dauphin, using Landsat data from the U.S. Geological Survey and data from the Context Camera on the Mars Reconnaissance Orbiter. Photographs by Jacob Richardson for NASA. Story by Adam Voiland, with information and fact checking by Jacob Bleacher, Patrick Whelley, Jacob Richardson, Dan Berman, and Gareth Morgan. One of the defining features of the surface of Mars is the stark divide between the heavily cratered highlands on the southern two-thirds of the planet and the flatter, younger lowland plains that make up the northern third. Just north of the divide lies the Central Elysium Planitia—one of two large volcanic regions on Mars and the location of the youngest volcanic rocks (about two million years old) on the planet. The region has dozens of gently rising shield volcanoes, some of which have ripped long, narrow fissure vents into the surface. Geologists believe that sometime between 500 million to 2 million years ago huge quantities of lava—and occasionally water—poured from these fissures, spilling across the surface and smoothing over many craters. These outpourings of lava are called “flood basalts” or “traps”; on Earth, famous examples can be found in Washington state, India, and Iceland. Nevertheless, Central Elysium Planitia has more impact craters than Earth, where they tend to erode quickly because of all the liquid water and because of the surface recycling that comes with active plate tectonics. According to one analysis, Central Elysium Planitia has roughly 15,000 impact craters despite its young age. 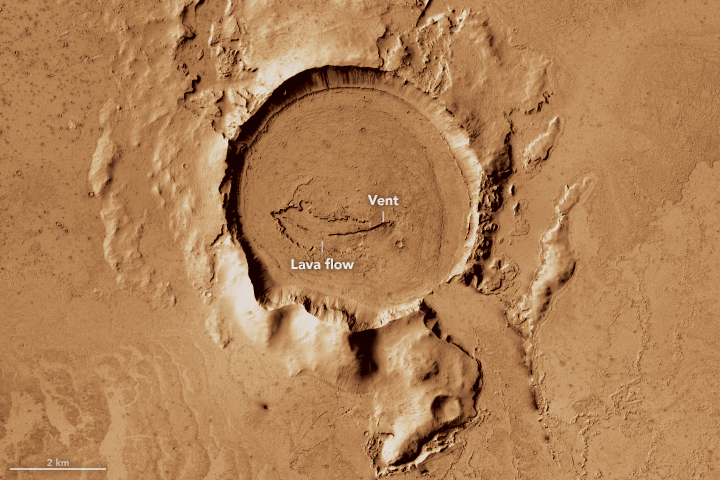 The image above, captured in 2012 by the Context Camera on the Mars Reconnaissance Orbiter, shows such a crater with a distinctive fissure vent and lava flow. The precise volume or age of the eruption that caused the lava flow in this Elysium Planitia crater is not clear. However, this does appears to be a relatively young and small flow for this part of Mars. The vent’s location within the crater is likely a coincidence, though the force of the collision may have weakened the rock below the impact site in a way that made magma more likely to emerge. The crater is centered at 1°S, 160°W, which puts it near the Martian equator. 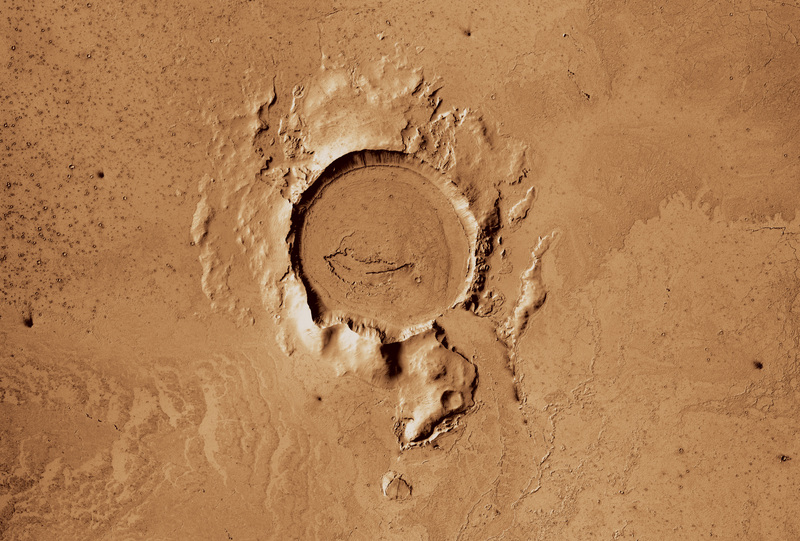 It is about 600 kilometers (400 miles) south of a much larger network of large fractures in the Martian surface known as Cerebus Fossae, the likely source of most of the lava that flooded Central Elysium Planitia over the past 200 million years. Planetary geologists look to certain volcanoes on Earth to understand how volcanic processes play out on Mars. While there are some key differences, basaltic lava flows on both planets have similarities. For instance, there are parallels in the way flood basalt has poured from a vent at the Holuhraun lava field in Iceland in recent years and the way flood basalt spread out in the Elysium Planitia crater. 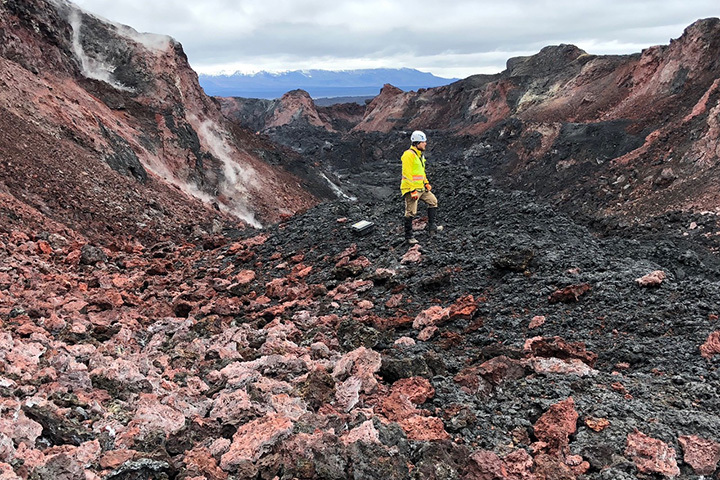 For this reason, a group of planetary scientists from NASA’s Goddard Space Flight Center and researchers from the University of Arizona, NASA’s Johnson Space Center, and the University of St. Andrews all traveled to Holuhraun in the summer of 2018 to study the young lava flow. There they tested several sensors that could eventually be used in future satellite missions or by astronauts exploring Mars. 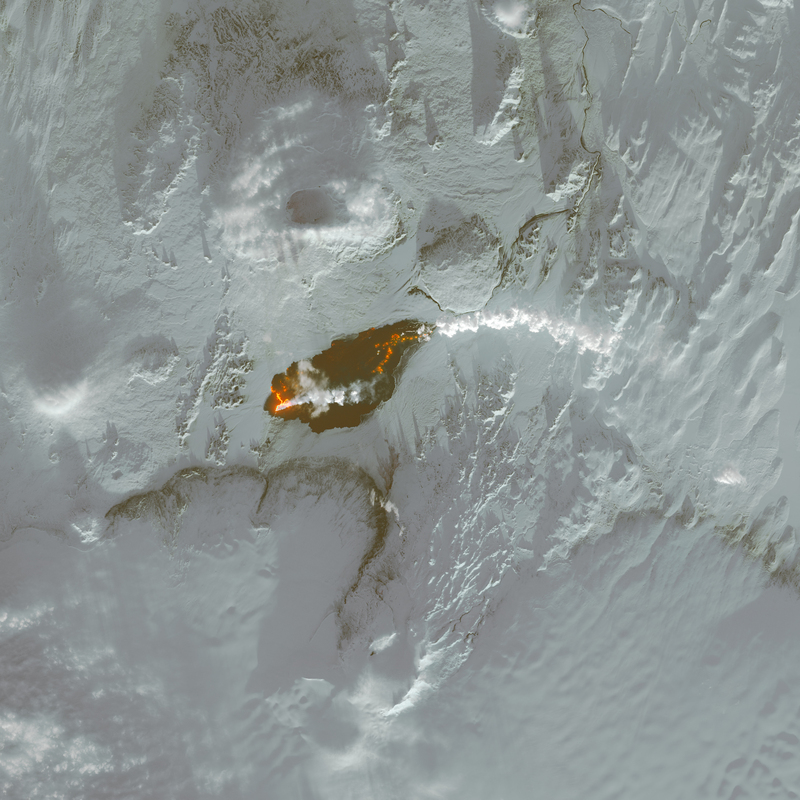 The Operational Land Imager (OLI) on Landsat 8 captured an image of lava pouring from Holuhraun on January 2, 2015. The false-color image combines shortwave infrared, near infrared, and red light (OLI bands 6-5-4). The plume of steam and sulfur dioxide appears white. Newly-formed basaltic rock is black. Fresh lava is bright orange. 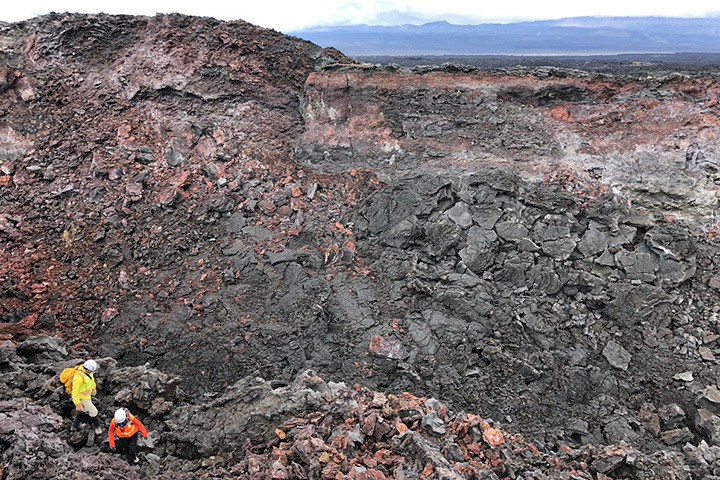 The photographs on this page show members of the research team exploring the young basaltic rock found in Holuhraun’s vent in August 2018. The eruption at Holuhraun began in August 2015 and continued through February 2016, becoming Iceland’s largest eruption by volume since 1783. “In both cases, the fissures formed when dikes filled with basalt reached the surface and erupted,” explained Patrick Whelley, a planetary scientist and part of the Goddard Instrument Field Team. “Basalt does what basalt does,” on both planets, though on Mars the same packet of lava tends to flow about six times farther than on Earth because of differences in surface pressure, temperature, and gravity. The conditions that affect the two lava flows are also quite different. With so much liquid water in Iceland, the Holuhruan flow will erode rather quickly. In contrast, the Central Elysium Planitia is so dry and cold that lava flows can remain largely unchanged for long periods. That is not to say that this part of the Central Elyesium Planitia has always or will always be dry. The surface of the plain contains evidence that huge episodic floods of water have poured from those vents at times. The flows of water were likely triggered by the heat of volcanic eruptions melting subterranean ice. Water may have even eroded the breach in the southeastern portion of the crater rim before lava poured through it during a later eruption, noted Jacob Richardson, a NASA planetary geologist and member of the GIFT team. You can learn more about the GIFT team by following their blog or searching for #NASAFieldWork and #NASAFireAndIce on Twitter. Arizona State University G19_025499_1789_XI_01S200W. Accessed September 26, 2018. Baratoux, J. et al. (2009) The volcanic history of central Elysium Planitia: Implications for martian magmatism. Icarus, 204, 418-442. Berman, D. & Hartmann, W. (2002) Recent Fluvial, Volcanic, and Tectonic Activity on the Cerberus Plains of Mars. Icarus, 159 (1), 1-17. Burr, D. et al. (2002) Recent Aqueous floods from the Cerberus Fossae, Mars. Geophysical Research Letters, 29 (1), 1-4. Keszthelyi, L. et al. (2004) Icelandic analogs to Martian flood lavas. Geochemistry Geophysics Geosystems, 5 (11). 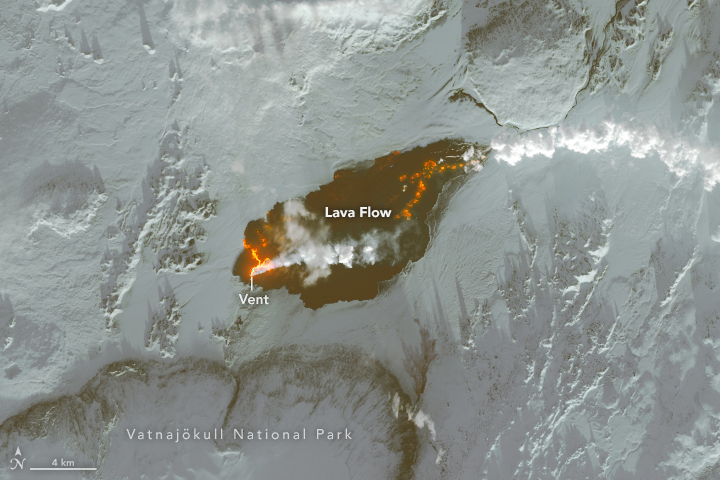 NASA Earth Observatory (2014) Holuhraun Eruption. The University of Arizona Lava Vent in Impact Crater in Elysium Planitia. Accessed September 26, 2018.